A photograph of a sign at the Balingup Medieval Carnivale. The sign marks the stage area of the Carnivale site, labelled the ‘Jongleur Path’. ‘Jongleur’ is a term from Old French used during the medieval era for a wandering entertainer, usually a minstrel, as the illustration on the sign of a man playing a lute depicts, or poet. 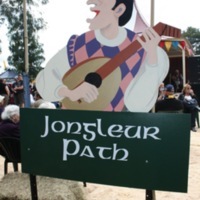 “Jongleur Path, Balingup Medieval Carnivale,” Medievalism in Australian Cultural Memory, accessed April 25, 2019, http://ausmed.arts.uwa.edu.au/items/show/571.